Our cutting chaps are made here at our facility in the USA and are built with the quality leather tanned in the USA. The cutting chaps are in-stock and ready to ship in sizes small through extra large. Why cutting chaps? They are a full length chap which normally secures to the upper leg. They also normally have fringe. Our standard fringe length is 8 inches. They are very similar to a western batwing style chap except that they have a "dropped heel". The dropped heal is designed to cover the rider's boot heel and spurs. It conceals the riders "cue" to the horse with spur or heel movements so those "cues" are not obvious to spectators or judges. A cutting chap is not normally worn for pleasure riding because the "dropped heal" hangs below ground level. The dropped heal can be trimmed off for pleasure riding. 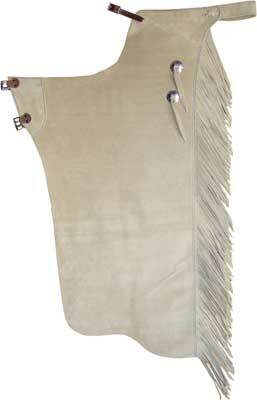 Available leather: They are made with 4-5.5 ounce sand suede leather that is tanned in the USA. The suede leather can be brushed for easy cleaning. Size adjustment: The backbelt is doubled and stitched and is laced on in v-braid style. It can be adjusted larger by 2" and can be adjusted smaller if more holes are punched. The front belts are 5/8" latigo leather and are also adjustable. The leg straps are adjustable plus or minus 2”. The basket stamped version of the cutting chap has two conchos that attach the backbelt. It can can be adjusted 2” larger or any amount smaller if more holes are punched. Chap length: Our cutting chaps can be trimmed to shorter lengths. Please refer to the detailed photos for information on how much length may be trimmed. Order information: Please look at all the available photos when looking at the details of the individual cutting chaps. We have all the information available that you will need to select the correct size. There are several photos available when you "click on" or select an individual chap. You will see a photo of the chaps, a photo of measuring instructions, a photo with the chap dimensions, and a photo of how to re-lace the backbelt to adjust size. We have made every effort to make your selection process as easy as possible, but if you still have questions or if you want us to walk you through the order and sizing then please call us at 208-785-8963. Front belt - 5/8" latigo leather with 40-T buckle on basic cutting or Chrome cart buckle on basket cutting chap. Back belt - adjustable 1.5" doubled & stitched, attached with v-braid.